“Friday Favorite” is a new series I’m starting in which I share a product or service that I love. A Friday Favorite placement cannot be purchased, and you cannot give me a free sample of your product/service for consideration as a Friday Favorite. A Friday Favorite is something I have discovered on my own. It is free from any commercial influence or compensation. My only reward is the joy it brings me to share something that will make your life better. I also love alliteration, which is why it’s a Friday Favorite, not a Monday Favorite. I don’t intend to do this every Friday, just whenever I have something I want to share. My first Friday Favorite is the online coupon site Retail Me Not. Whenever you’re buying something online and you see a field in the order form labeled “Coupon” you should immediately head to Retail Me Not. Chances are they will have a discount code that will save you money. I don’t know exactly how much money Retail Me Not has saved me over the years, but I’d guess it’s several hundreds of dollars. Last week I saved $37.50 in a single purchase from one of their coupons. I never pay full price for a domain name. And all it takes is one minute spent on their web site. Coupons have expiration dates, so you may have to try several codes before you find one that works. There is a success rate percentage listed next to the coupon which is based on the number of thumbs up and thumbs down it’s received. If you are a retailer, you can request that the site not list your coupons, so in those cases a search disappointingly turns up nothing. 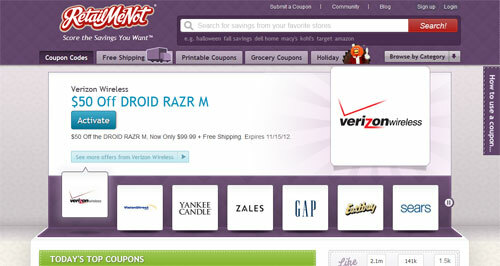 There are other coupon sites on the web, but I like Retail Me Not the best because it has a clean, easy-to-use interface. They also have a list of Top Coupons on their home page if you want to scout for deals without a specific retailer in mind. Go forth and save money! Excellent. I’m going to check that out. Thanks! YAY! What a great idea for a regular piece, and I **LOVE** how you are working to steer off the inevitable PR spam that could result. p.s. Retail Me Not is one of my favorite resources on the Internet. I never shop on-line without checking Retail Me Not. I am almost always able to find a coupon. They are fantastic. I am glad you shared this! This site and coupon cabin (yay more alliteration!) are my go-to sites for Lane Bryant coupons. Usually I can find the big discount coupons there. I never buy anything in the store anymore unless it is 50% off night. Retail Me Not is one of my favorites, but I always use it hand in hand with eBates to save even more.